It's almost a decade that Maurizio Bianchi, which needs no presentation for readers of this zine, and Matteo Uggeri, mostly known as a member of Sparkle in Gray, collaborates in some form. As their previous collaboration this are based on relatively quiet framework where the ambient textures of the late M.B. are introduced in a more constructed sound building. While many could expect an harsh noise wall, "Infinity Cosmic Eruption" introduces the listener into a release where ambient music is bound in a rhythmic cage that is at the crossroad between hip hop and dub, so it's impressively dilated in time and takes in the background the noisy element which is used to create a subtle sense of movement in an apparently static rhythmic development; its quiet ending introduces "Sidereal Decomposition Activity" whose catchy noisy and almost psychedelic melody is underlined by the rolling beat interrupted when it's time for a break prior to the final dreaming end. The metronomic beat of "Astral Fall Dynamism" is the set for the dialectic between noise and folk guitar melody of the first part of the track while the second one tries to bury the melody with synthetic layer only to close the track with menacing oscillators. The crescendo of "Unearthly Armagheddon Energy" is as linear as it's ended leaving only the element that creates tension without the elements that has rhythm or mass. Moving towards a more developed music style rather than a impressive mass of sound or quiet ambient, this release shows two artist that are willing to evolve rather than simply publish another record. Recommended. The OO-Ray is the alias of Ted Laderas, an improvisatory and experimental cellist, whose playing style is self defined as “chamber drone”. This really means that his music is based on the electronic treatment of the instrument so the melody, rooted in a traditional instrument, is transformed in a sort of texture which evolves in a much more clear way than canonical drone. He also use a custom-built software which creates a rhythmic layer vaguely reminiscent of glitch music. The framework of "Liminal" introduces the listener into a sound field based on dilated tones, or long loops, and ephemeral resonances while "Stuttertest" returns to the destructured lines of glitch and "Fiftytwo" use pseudo romantic notes of piano. An interlude for reverse tape, "Hoh", is followed by "Reveal", a static and ethereal track, and "Semifinal" where a sort of catchy melody emerges and is closed by "Worden" which sounds as the second part of "Hoh". "Largesse" seems to dilate chamber music and "Downwards" folk music. "Circular" with its use of strings borders modern classical territories while "First Frost" returns to more canonical ambient territories and "Adaptation" evolves in a static way. The crystal clear melodies of "The Drowned World" and the resonances of "Afterimage" close this release with a sort of glitch classical. The lack of a path which ties the track togheter, instead of creating confusion, generates a pleasant sense of variety which escapes boredom. Nothing ground-breaking but a good musique d'ameublement. 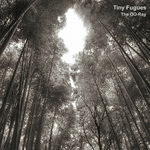 Recommended for fans of ambient and modern classical. As the artwork and the title associatively suggest, this work evokes thoughts of the build-up of tension in sci-fi clouds before a thunderstorm. There’s windy drones, distant atmospheric hums, and electrical crackling and bubbling interspersed with gentler more melodic pads and beds that arrive with some fanfare to provide lush interludes. On some rare occasions, more pulsing electronics step very modestly towards a sort of incidental techno, but this is always short-lived. Built from synthesis and from abstracted field recordings, it’s a gently unsettling bit of soundscaping that feels calm on the surface, but harbours more chaotic elements for which you have to listen more closely. The 51-minute work is divided into three parts that are both numbered and named, but the differences between them are subtle and evolutionary rather than distinct. Third part “The Sound Of The Universe Spinning” is perhaps the warmest and most relaxing section, working as a fitting conclusion when listening to this for its soporific superficial level. It’s a rich and detailed texture of sonic work, handled with a deftness and confidence that makes it certainly worthy of attention. Hot on the heels of the review of Barnacles collaboration with Maurizio Bianchi we have Barnacles (Matteo Uggeri) latest work - 'Air Skin Digger,' an album of 4 long compositions made using only 4 sound sources per each, all cannibalized from other works done in his more than 20 year musical career by Uggeri or with his band Sparkle in Grey, or with other collaborators. No digital sounds have been used in the recording, but only instruments such as viola, bagpipes, trumpet, guitars, gamelan, and unknown devices. The four tracks all have lengthy, but ultimately highly descriptive titles. 1. How a slave who perpetually defamed me and desired to have me killed, was himself eaten and killed in my presence. 2. Of the manner in which the savages ate a prisoner and carried me to the feast. 3. How the savages ate the second roasted Christian called Hieronymus. 4. My prayer to the lord God when I was in the hands of the savages who threatened to eat me. The artwork by Uggeri himself is an interpretation of the woodcuts taken from “True Story and Description of a Country of Wild, Naked, Grim, Man-eating People in the New World, America)”by Hans Staden (c. 1525 – c. 1576), which compliments those track titles. Although there is a certain ritualistic ambience in the music (mainly due to the rhythm/percussion), it certainly seems to be an abstract interpretation in total. Track 1 has a rather somber mood, at least until the drumming enters the picture a little over 3 minutes into the piece. It's jazz inspired and polyrhythmic in stark contrast to to the droning ambience. Track 2 begins with repetitive looped guitar riffs later giving way to some indistinguishable samples (field recordings?) while a steady beat emerges, The looped guitar samples are manipulated over time in such a way as to be in sync with the rhythm where before they were just disjunct elements. Barnacles gets a real groove going, then stops all dead but the beat, and morphs it into something almost completely different. Remember from earlier - there are only 4 sound sources employed here. While you may be getting the impression that this music is improvised, it is actually highly structured. Track 3 sounds like the most ritualistic of the lot, perhaps in part due to the exotic flute sounds and bellish tones. There is a calm before the storm here with various sonics in play, but the tension is palpable as the rhythm begins to build in its tribal fury. It's more of a seething sort of tribalism than war-like manifestations, and you could imagine it as the background for some sort of sacred ceremony, perhaps where ayahuasca or some other natural hallucinogenic was involved. Track 4 begins with somber strings but it isn't long before they are supplanted by a driving rhythm and indistinct lengthy agitated conversation samples. When the drums die down we''re left with an interlude of lengthy dialogue sample and the return of sad strings. The drum rhythm creeps back in but its different this time; less driving and more ominous. Eventually, fade to black. This is an enigmatic work to say the least, and that these compositions were made using only 4 sound sources is remarkable. Although this album may never end up being number one on your hit parade, it is something to turn to when you're looking for something completely different. Limited Edition of 300 CDs, but as of this writing, there were only 17 copies left. 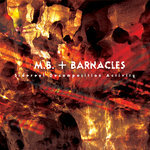 M. B. is Maurizio Bianchi, and Barnacles is Matteo Uggeri, two leaders in the modern Italian electronic industrial avant-garde. Bianchi (in case you didn't already know) is a pioneer of industrial music going way, way back to the earliest 1980s. To list his credits and collaborations would take more space and time than I have available. Matteo you may know from Sparkle in Grey, some of whose works I've reviewed here in the not too distant past. The first collaboration between these two came about in 2007 with the release of the album 'One Single Sound' . On this recording MB provides analogue noises, drones and melodies, while Matteo utilizes beats, keyboards, field recordings and Tibetan bells. Drum work is done by Simone Riva and Cristiano Lupo. As MB describes the music of this work: "Astral melodies are excavating in the eruption constriction, while a neurotic fall scratches extemporaneous sidereal manumissions. The salubrious dynamism is compatible with the invisible decomposition but a paranoic infinity recalls an overcast activity for a cosmic relativity. Unearthly diagnosis cheers the outward for a screaming Armageddon, grinding through our nocturnal energy in the consolidate universe." The album is comprised of four long tracks between 8 and 13 minutes length. Opening track "Infinity Cosmic Eruption" begins with sustained cymbal(s) or gong(s) ringing out and some thumping around as well as some other unidentifiable bits of sound. Out of this comes a heavy rhythm on drumkit with a sustained harsh, cutting drone. Most of the harsh portions of the drone eventually subside over time replaced by some noisy electronics. Various electro-acoustic sounds can be heard, often echoed off, as the piece deconstructs in a piercing, whistling drone after the drums drop out. Title track "Sidereal Decomposition Activity" has loopy abstract semi-melodic electronics over a beat that sounds Native American. Over time the rhythm gets jumbled through sonic manipulation and loses its straight path morphing into something more freeform. All the while these improvised electronic sustained tones keep right on playing. There is somewhat of a psychedelic ambience to it all, and when the drums return in a different pattern, I'm reminded of some of the Krautrock experiments of the 1970s. The end of this track with its spacey, echoey electro-drones moves seamlessly into "Astral Fall Dynamism" and I suspect that the ebow guitar is largely responsible for some of those sounds. Here everything is mixed into some type of strange brew with elements of electronics, plunked and rapidly fingered stringed instrument(s), amongst other sonic effluvia. It's a dense, abstract porridge of psychedelia obviously intended to be mind-blowing. As with the previous, the looped electronics/noise drone blends seamlessly into the next (and last) track "Unearthly Armagheddon Energy". Heavy orchestral strings, fizzy noise and a rudimentary rhythm that seems to turn into a chugging steam train. The string pads on this one remind me a lot of Tangerine Dream's use of them, but on which album I can't remember. Nostalgic, at any rate. The whole thing had me thinking of Kraut rock experimentation of the 1970s as a pastiche of the genre. I don't know if that was intentional or subliminal, but the ethos seems to be there. This is certainly not an album for everybody. There is no concession to commercialism in any regard, and although I wasn't hearing anything that I haven't heard before in one way or another, it still makes for an interesting listen.